Plot Summary: On their way to a singing contest, Mai and Saki meet a mysterious man looking for the oldest clock in town. It turns out that this clock is a portal to the World of Clocks, and the mysterious man is a servant of Dark Fall who wants to stop time to destroy the world. With the help of the clock spirits, Pretty Cure must fight to escape his perfect maze and start time flowing again. 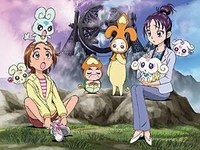 Takes place after episode 30 of Futari Wa Pretty Cure Splash☆Star.